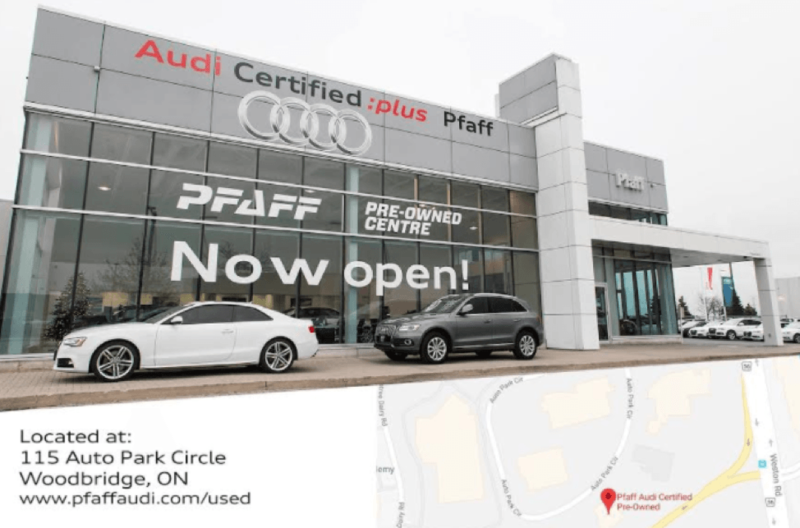 Finding used Audi vehicles in the Thornhill area is easy when you choose Pfaff Audi Vaughan and our new used car facility. Located just around the corner from Pfaff Audi Vaughan at 115 Auto Park Circle in Woodbridge, our used car dealership has the selection you are looking for. From SUVs and sedans, to coupes and sports cars, our new used car lot is ready for you to experience! If you live in Thornhill, Ontario, or the surrounding area, and you are looking for premium quality and certified pre-owned vehicles, why not try Audi? Read on for more information about the benefits of buying used Audi vehicles at our used car facility. One of the biggest reasons consumers choose used Audi vehicles is that the used models are often more affordable than their newer counterparts. Today, the price gap between new and used vehicles continues to widen. For many consumers, this brings a luxury vehicle, like those made by Audi, into a buyer’s price range. Typically, the older and more kilometres an Audi has on it, the cheaper the vehicle is to the buyer. While new Audi vehicles give consumers freedom of choice on the details of a specific, currently-manufactured Audi model, used Audi vehicles give buyers the largest vehicle selection generally. Typically, new Audi vehicles are only available in the current line of models manufactured by Audi. On the other hand, consumers have access to a range of Audi models that are currently manufactured, as well as those that are discontinued. Therefore, for buyers interested in a used Audi, there are many more models to choose from than those currently coming off the production line. This may help a consumer find a type of vehicle that perfectly fits their needs. Consumers who choose to purchase used Audi vehicles avoid the depreciation factor. New cars drop in value immediately after they leave the dealership. On mainstream vehicles, like an Audi, a new model loses its value up to 30 per cent in the first two years. This means that a consumer loses money down the road when they try to resell the vehicle, in comparison to what they paid for the car. On the other hand, buyers of used Audi vehicles can likely recover much closer to the price they paid for the vehicle in the long run. However, this is subject to how well a consumer maintains the Audi over the course of its operation. If you are looking for used Audis in the Thornhill area, we recommend that you don’t hesitate, and come to our new pre-owned car facility at 115 Auto Park Circle in Woodbridge. We have hundreds of Audi vehicles to choose from, and you can test drive any vehicle you want! For more information about our used vehicles at Pfaff Audi Vaughan, please feel free to continue browsing through our website. Click here to find our contact information, fill out our contact form, and schedule a test drive today!